Below are complete instructions on how to play Hanafuda Hawaii Style. Each section includes a short animated video. Hanafuda Hawaii Style playing cards have many aids to help make learning to play easy and fun. Most importantly, the point value of cards has been added to the top left. The traditional Japanese months written on the top right of the cards represent the old Japanese lunar calendar months. They do not exactly match modern calendar months, but the suits will be referred to by their roughly equivalent English names. Use these to match suits, or hiki. On the bottom, are aids to help match bonus point combinations, called yaku. The deck is composed of 48 cards. They are divided into twelve suits, one for each month of the year. Each suit or hiki has four cards. The same plant is shown as the common element on each of these four cards. For example, cherry blossoms are depicted on all the cards representing the month of March. The picture below shows the cards in order starting with January on the left and ending with December on the right. Four of the most ornate cards are worth 20 points. Eleven cards are worth 10 points. Ten of these cards are decorated with a rectangular piece of paper used for writing poetry, called tanzaku. Ten other cards with birds, butterflies or other animals are worth 5 points. The rest are “plain” cards, called kasu, with zero point value. Win by accumulating the most points by matching cards. The total possible score is 240 points. There are many different games played with Hanafuda cards in Japan, Korea, Micronesia, and Hawai‘i. 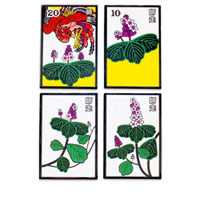 The Hanafuda Hawaii Style cards are specially designed for playing the game called Sakura, which is specific to Hawai‘i. Rules vary depending on whom you ask, but the following instructions explain the fundamentals of the game. Make sure that everyone agrees to the same rules before playing. Two to six people may play the game. It is also possible to play as partners: four players, on two teams, or six players on three teams. When playing as partners, each team places all captured cards together for the team. However, players are not allowed to show each other the cards in their hand. First, determine the dealer, or oya. For the first game, each player draws one card randomly from the deck. The player with the earliest month in the year is the dealer. After each game, the winner becomes the oya (dealer) for the next game. The player to the dealer's left shuffles the deck of cards, and offers it to the player on the dealer's right for the cut. When there are only two players, the player who shuffles passes the deck back to the dealer. To cut the cards, take a portion from the top of the deck and put those cards on the bottom of the deck. You may also tap the top of the deck instead, to indicate that you are satisfied with the shuffle. The dealer then deals the proper number of cards to each player face down in a counter-clockwise direction. Next, the dealer places the proper number of cards face up on the table, or in the “field.” The remaining cards are placed face down in a stack to draw from. Refer to the following chart for the number of cards to deal. The goal is to match cards with ones in the same suit or hiki in the field. Only cards with a point value add to a player's score. The dealer has the first turn. The order of play flows in a counter–clockwise direction. Each turn has two parts. First, a player draws a card from her hand and places it in the field. If the player has a card that matches the suit of a card in the field, she places the card from her hand on top of the matching card in the field to show everyone the match. The player then takes both her own card and the card she has captured and places them face up in a “points section” in front of herself. She then discards any cards with no value in a kasu (rubbish) pile behind the drawing stack. Second, the player draws one card from the drawing stack. If that card matches a card in the field, the player must take the pair of cards. Otherwise, she leaves it face up in the field. This ends a player’s turn. It is possible to capture up to 4 cards per turn. The player to the right takes the next turn. The play continues in a counter-clockwise direction until all the cards have been used in each player’s hand. If playing with teams, each partner sits across from the other. Remember, the direction of play goes counter-clockwise. The gaji (lightning) card is part of the November suit. If the gaji is in the field, a player can capture the gaji by matching it with another card in the November suit. If the gaji card is part of a player's hand he can use it like a wild card to capture any card in the field regardless of its suit. Keep the gaji paired with the captured card. Any cards from the captured suit remaining in the field at the end of the game go to the holder of the gaji card. The gaji card cannot be used as a wild card if there is a hiki held by another player. In special situations, a player can claim all of the cards from one suit or hiki in a single turn. If all four cards of a hiki are in the field at the beginning of the game, the dealer takes all four cards. If a player sees all 4 cards of a suit, in whatever combination, either in her hand or in the field, she can declare a “hiki” and capture all 4 cards. For example, if a player has one card in her hand that matches three in the field, she can declare a “hiki” and take all three cards in the field in one turn. The player holding a hiki does not need to declare her hiki until another player attempts to capture one of the cards in her hiki with a gaji card. The game is over when there are no more cards in the players' hands. Each player counts his points and the one with the greatest number of points wins. Only cards with a point value are counted. If the scores are tied, the dealer wins. A tie game is called a tonton. If players other then the dealer are tied, the player closest to the dealer's right is the winner. If the dealer wins by virtue of being the oya (boss), he is called oya kachi (boss winner). Once you get used to playing for only the point values of cards, you can add special card combinations called yaku to the play. This addition makes for a much more exciting and challenging game. Yaku (bonus combinations) are special three–card combinations. There are eight yaku in this game. The yaku are counted at the end of the game. If a player gets one or more yaku, all the other players must deduct 50 points from their total score for each yaku held by another player. If a player has two yaku, everyone else must deduct 100 points. If there are three players and two each have a yaku, the two players with yaku must deduct 50 points each, and the third player must deduct 100 points. If a player defeats his opponent by at least 50 points, it is called a chu victory. If the margin is more than 100 points, the player can claim a basa victory.